Powers/Abilities: Presumably a magically-empowered jinn/genie, the full extent of Super Slave's abilities is unrevealed. 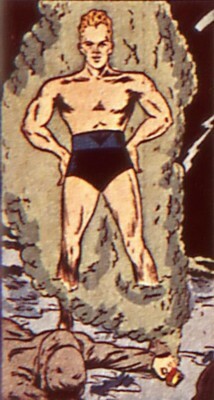 Demonstrating the power to alter his stature, he was able to grow to a towering giant (perhaps 100 feet tall), and reduce himself to a miniature size (perhaps 6 inches tall). 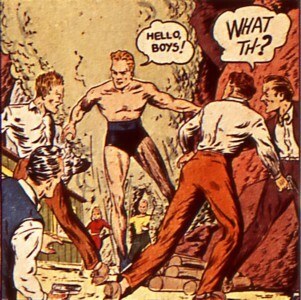 Having an athletic physique, he appeared to have some degree of superhuman strength, and his body was bulletproof. 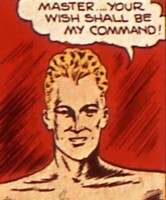 Super Slave was magically bonded to a bracelet, and he considered the individual in possession of it to be his master. He could be summoned by means of his master scratching or rubbing the bracelet, after which he would appear in a billowing green mist; conversely, when his master scratched or rubbed the bracelet again, Super Slave would disappear in a blinding flash. (Mystic Comics I#5/2 (fb) - BTS) - The past of the Super Slave is unrevealed, but at some point "thousands of years" in the past, he was bonded to a bracelet--he would rest within the bracelet as the centuries crawled by. The bracelet somehow became lost in the North Atlantic, but it was eventually washed ashore on a beach somewhere on the American coastline. (Mystic Comics I#5/2) - One night, Cappy and Jane were aboard Cappy's fishing trawler during a raging storm--the swelling waves washed the two overboard, and they were separated in the turmoil of the undertow. Cappy was tossed upon the shore, but Jane appeared to have been swallowed by the sea. The weakened old fisherman tried in vain to rise and search for his daughter, and as he desperately wished aloud that he had the strength to find her, his fingers happened to brush against the ancient sea-worn bracelet. Suddenly, a billowing green mist appeared from an opening in the bracelet; a tall figure materialized and told Cappy, his new-found master, that he would do as commanded. Growing to giant-size, the strange being parted the sea with a swish of his powerful arms and retrieved Jane, then he placed the unconscious girl next to her father on the beach. Resuming his normal height, the mysterious figure stood watch over the exhausted Cappy and Jane throughout the night. When morning came, Jane and Cappy revived to find the tall stranger standing over them; the mysterious figure assured them he could not harm them, for he was their slave. The slave explained to Cappy that when he had scratched the bracelet, he had brought him to life from a rest of thousands of years; the slave told Cappy to wear the bracelet so he could appear and disappear as Cappy wished. Cappy placed the bracelet upon his wrist, scratched it, and the slave vanished in a blinding flash. Still puzzled at the strange happenings, Cappy and Jane walked along the beach in search of civilization--they reached a cove and came upon a shack. 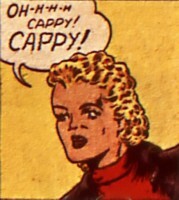 When Cappy and Jane went to the door of the shack, they were met by four gun-wielding thugs. Although Cappy tried to convince them that he and his daughter were shipwrecked and were only trying to find their way to the nearest town, the thugs doubted his claims and were about to execute the two; before the thugs could fire their guns, Cappy rubbed the bracelet and summoned his servant. 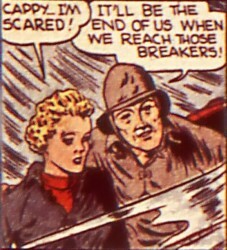 The slave fought with three of the thugs, but the fourth seized Jane and threatened to kill her unless Cappy sent his slave away--seeing that he had no other choice, Cappy complied and scratched the bracelet, causing his magical servant to disappear in a flash. The thugs locked Cappy and Jane in the shack; while they were imprisoned, Cappy was trying to think of a way for them to escape when he accidentally rubbed the bracelet--this time, the slave appeared at doll-size. Using his small stature to his advantage, the slave surreptitiously removed the bullets from the thugs' firearms so no one would be harmed by any gunfire, then resumed his normal size and fought the four. After knocking all the captors unconscious, the slave asked Cappy if there was anything else he wished--the incredulous Cappy was just amazed that he had control of the most powerful man on Earth... a Super Slave! Comments: Created by Paul Gustavson (writer and artist). And although the blurb in the final panel promised another Super Slave story in the next issue, this 8-page tale would be his one-and-only appearance, so the cliff-hanger remains unresolved. There was no explanation as to why the four thugs were stationed in that shack, but I assume they were working with the crew of the Mary J. Their last names unrevealed, Cappy was an elderly fisherman, and Jane was his daughter. One stormy night, the two were aboard Cappy's fishing trawler in the North Atlantic; the boat was wrecked during the raging storm, and the two were washed overboard. Cappy found himself tossed upon the shore, but Jane seemed to be swallowed by the sea. As the weakened Cappy vainly tried to rise and search for his daughter, he wished aloud that he had the strength to find her while his fingers brushed against a magical bracelet; Cappy then found himself the master of a Super Slave, who saved Jane from the watery depths. Cappy placed the bracelet on his wrist, and as he and Jane were walking along the beach, searching for the nearest town, they encountered four armed thugs in a shack. 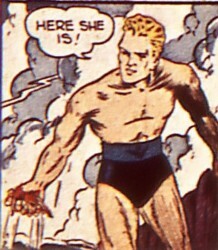 The fisherman and his daughter were saved from death when Cappy rubbed the bracelet and summoned his magical servant. The final fates of Cappy and Jane are unrevealed (see comments). An ancient golden wristband adorned with a large red gemstone, its origins are unrevealed. It acted as the resting place for the Super Slave, who was magically bonded to it--he had been confined within it for thousands of years. The bracelet apparently had an opening through which the Super Slave could exit and re-enter. By scratching or rubbing the bracelet, the possessor of it could release the Super Slave and command him as his master. 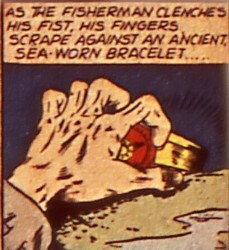 Under unrevealed circumstances, the bracelet had been lost in the waters of the North Atlantic, but it eventually washed ashore on a beach on the American coastline, where it was discovered by the shipwrecked Cappy. Cappy later wore the bracelet on his left wrist. Four unidentified gun-toting criminals; for unspecified reasons, they were stationed in a shack in a cove on the American coastline (see comments). When Cappy and Jane were shipwrecked, the two chanced upon the thugs' shack. The thugs were about to kill the fisherman and his daughter, but they were unaware that Cappy had earlier found a bracelet which made him the master of the Super Slave--the thugs were pummeled unconscious by Cappy's magical servant.